Luke McGee insists Peterborough United will relish rather than fear their FA Cup trip to Chelsea on Sunday (January 8). Goalkeeper McGee, one of the best recent signings by Posh, can expect to be busy at the home of the Premier League leaders, but he’s remarkably relaxed as the game approaches. Posh goalkeeping coach Mark Tyler in action against Gianfranco Zola at Stamford Bridge in 2001. It’s a measure of how much confidence he has in his own back four as Posh seek to protect a run of just one defeat in 13 competitive matches. “I’m preparing for the game the same way I do for every game,” McGee stated. “And that’s the same for the rest of the lads. “I can only deal with what comes my way. I can’t worry about anything else or worry about how difficult the game might be. “The whole squad is very relaxed. We didn’t give Chelsea a thought until we finished the League One games over Christmas, but now we are relishing the occasion. Posh goalkeeper Luke McGee makes a save. “We are certainly not fearful and we won’t be intimidated. There is no pressure on us. “It will be great to be on the same pitch as some great players, but we will be competitive. We don’t know any other way to play. “I expect to be busy, but like them we are on a very good run and defensively we’ve been very strong which is important. “I’ve been pleased with my own form, but the form of the back four and the midfielders who help out defensively has also been very good. McGee is on loan from Spurs and he’s aware that helping to knock great rivals Chelsea out of the FA Cup would increase his stock considerably among the North London club’s fans. But his priority is helping Posh pull off a famous win. “I was at the Chelsea/Spurs match last season when our hopes of winning the Premier League disappeared,” McGee added. “The clubs are big rivals, but this tie doesn’t have an extra edge for me because I’m a Spurs player. “It’s a big enough game anyway, certainly the biggest I’ve ever played in, especially in terms of crowd size. 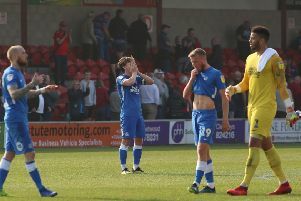 And if McGee wants any tips on how to cope with facing big name players in a packed stadium, he can ask the Posh goalkeeping coach, and first-team back-up, Mark Tyler. Tyler was in goal for Posh 15 years ago when Gianfranco Zola and Jimmy Floyd Hasselbaink were leading the Chelsea forward line. McGee said: “Mark hasn’t said anything about the game yet, possibly as he let five goals in! “But seriously he has been a big help to me since I’ve been at Peterborough. “Mark’s been in the game for a long time and the fact that he is still playing so well at his age is a great credit to him.